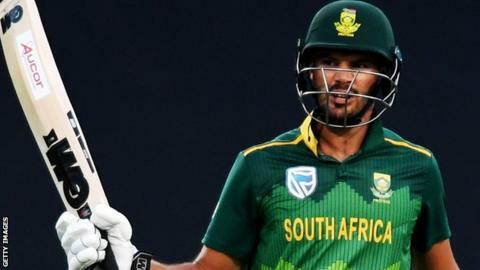 South Africa opener Aiden Markram will join Hampshire as their overseas player for the start of the season. Markram, 24, replaces original signing Sri Lanka opener Dimuth Karunaratne, who is in the frame to captain his country at the World Cup. He is expected to be available for Hampshire's County Championship opening fixture against Essex on 5 April. "He's a player we've looked at over the past couple of years," said Hampshire director of cricket Giles White. Markram, who himself could feature for South Africa at the World Cup from late May, had a brief spell at Durham last season. "He's done particularly well at the start of his international career and forged his way into their white-ball side recently," White told BBC Radio Solent. "We're really pleased to have secured Aiden and we look forward to welcoming him as soon as possible." Hampshire will have Markram available until the end of the group stages of the One-Day Cup, after which his availability will be dependent on whether he is selected for the World Cup. Should he be selected by his country, Karunaratne could arrive if his "playing commitments allow."